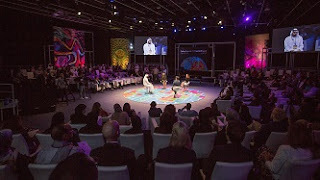 As one of five global partners for the Culture Summit Abu Dhabi 2019, the Solomon R. Guggenheim Foundation joins Google, UNESCO, the Royal Academy of Arts, and The Economist Events in developing five streams of programming to address the theme of Cultural Responsibility and New Technology. Led by the Guggenheim, the Museums Stream will engage an international group of cultural influencers, museum directors, curators, and artists to consider the role of museums—not solely as platforms for dialogue and understanding, but also as catalysts for transformative ideas and experiences. The program will address how the meteoric rise of digital technology, an evolving definition of culture, and shifting expectations from new audiences demand a reexamination of how museums, seen as stewards, conveners, and seekers, can evolve with the needs and pace of the 21st century. Comprised of three panels, the program will be held from April 7 through 11 at Manarat Al Saadiyat, Abu Dhabi. Moderated by Richard Armstrong, Director, Solomon R. Guggenheim Museum and Foundation; Alexandra Munroe, Senior Curator, Asian Art and Senior Advisor, Global Arts, Solomon R. Guggenheim Museum and Interim Director, Curatorial Affairs, Guggenheim Abu Dhabi; and Troy Conrad Therrien, Curator, Architecture and Digital Initiatives, Solomon R. Guggenheim Museum, these vital conversations will invite innovative, forward-thinking solutions to prescient questions: What are the influences shaping the next generation of global art museums? How can museums activate the past in the present? How can museums creatively embrace the “Digital Age”? How can museums, institutions fostering global citizenship, thoughtfully engage diversity that arises from new art histories while also honoring the legacy of the past? For the complete list of participants and full information on all five streams of programming, visit culturesummitabudhabi.com/en/. Culture Summit Abu Dhabi is a forum for invited leaders from the fields of the arts, heritage, media, museums, public policy, and technology, brought together to identify ways in which culture can build bridges and promote positive change. In its 2018 edition, the Culture Summit was attended by 350 delegates from 85 countries. The summit is organized by the Department of Culture and Tourism, Abu Dhabi. To register interest in participating, contact info@culturesummitabudhabi.com.